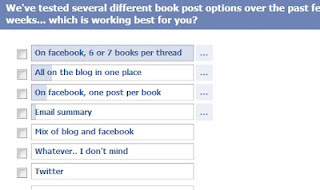 On the facebook page, we're conducting a poll about how you prefer getting the posts of books that we share. We have this blog, which is the one I have been doing the longest, since June 2009. The Facebook page started 18 months ago and was a place to do some of the highlights from here but it became very popular quickly, and though we moved page and lost some members last month, it's still doing well. Now the dilemmas. Having so many members leads to disagreements on how books should be shared. In an ideal world, I'd have time to put the books on all the places. I can do that sometimes but not always, sorry. The easiest way for me is on Facebook with one post per book - but this tends to clog up people's newsfeeds and so a while ago, we decided to limit that. 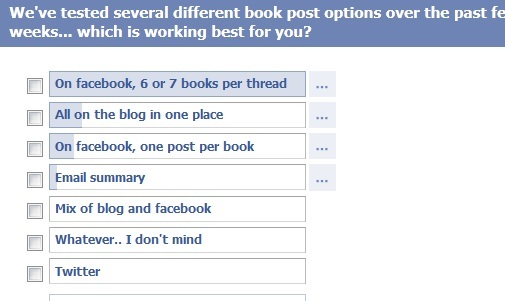 The next was to post 6 or 7 books to each post on facebook and making a thread. This is popular but received complaints that 1) people have an extra click to comments, and 2) some mobile users cannot click the links. Then there's the blog. A little more work for me but a great layout, the posts from here can be sent out in a daily email summary (optional), into numerous newsfeeds and google readers, and the blog can be searched much more easily. The complaint with this is that some people don't want to leave facebook to look at them. I am not completely sure why this is, but it is. This method is used by many others kindle facebook pages and is popular, but possibly one reason people stay with us is that we don't that. So we're voting. Options that are totally unpopular will probably be dropped - so if you want me to consider keeping something, vote for it.